We love this time of year! The holidays (Thanksgiving and Christmas) are coming and we celebrate with family traditions. One of our “oldest” traditions is picking out the perfect Christmas tree. It began when our children were small (our son wasn’t even born yet) and we lived in Pennsylvania. Shortly after Thanksgiving, we set aside an evening, take the family out for dinner then shopping for our (live) Christmas tree. We always go to the same place to get our tree and eat at the same Italian restaurant for dinner. 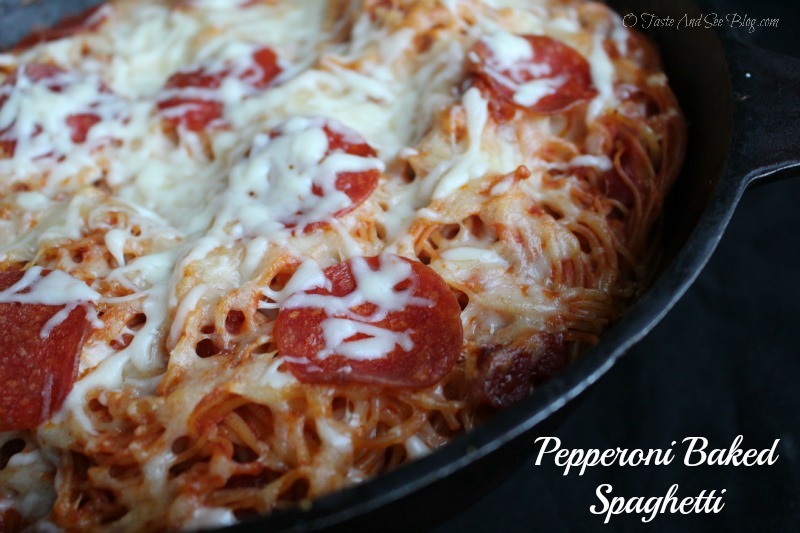 That restaurant has a dish that has inspired today’s Pepperoni Baked Spaghetti recipe. For this recipe I used my favorite brand of sauce, Ragu. I love the flavor and varieties of the sauces and they are Simmered in Tradition. For the first time in 35 years Ragu is sharing their story with the world. It all began in 1914 when Assunta Cantisano came to America from Naples, Italy. Assunta brought little more than her beloved family recipes with her as she settled in Rochester, NY. In 1937 during the Great Depression, Assunta had a desire to help provide for her family. Using fresh herbs and vine-ripe tomatoes from her back yard garden she began selling her homemade pasta sauce to neighbors, right from her front porch. Read the whole story here . We never know what kind of impact our family traditions will have on our children or even the world around us. Do you have a great traditional family recipe? Stop by Food.com and enter the Ready, Set, Cook! recipe contest! Grand Prize $3,000! How about any great family traditions? Ragu wants to hear them! Go ahead, stop by and share! I used pre-sliced for the top but diced my own for mixing with sauce. This type can be found with summer sausage, not in the pasta isle or refrigerated section of your store. It also requires "peeling", best done after slicing but before dicing.